I’ve been writing for six years now. Originally ,I started as a hobby, and took a few creative writing classes. I tried writing as many different genres as I could and entered short story competitions which was a great learning curve, and taught me to be economical with words. Eventually, I went back to writing longer pieces, and I now write exclusively for Carina UK! I write mainly romantic comedy which I really enjoy. My next novel, Secrets at the Maple Syrup Farm is about a guy called Clay who inherits a derelict farm from an uncle he never met. Clay’s running away from his past, and so was his uncle it seemed. Clay’s learns about his reclusive relative by reading some journals he finds hidden at the property. Lucy, is running away too. She winds up at the farm purely by chance and immediately falls in love with the place. Both her and Clay come to depend on each other, until an unexpected visitor arrives, upsetting their lives. It seems everyone has a secret, and the thing with secrets is, they never stay hidden. I was talking to a friend who I met online after he’d read the Gingerbread Café series books. He’d googled the town of Ashford, Connecticut, where all my books are set. We were discussing the town, the real town, as opposed to the fictional one – there was a street in the real Ashford called Pumpkin Lane, or something like that, and then I thought why not write a book that’s connected but not set at the café! The ‘pumpkin’ gave me the idea for creating a farm, so I must thank Graham for our chats, and that leading to writing this book! I’m reading Lessons from Ducks by Tammy Robinson, it’s absolutely brilliant! Travel around Australia in a campervan for a year! We recently met some ‘grey nomads’, friends of my family who were camped out the front of my mum’s house in the country for a while, and their stories were so amazing. They’ve been on the road for six years together, and have been around Australia a number of times! I would love to take the boys out of school for a year and go on a big adventure! One day! I think the Aussie sense of humour! It’s come a long way since the bodice ripper days! It’s modern, and relevant; whether you like comedy, or more serious contemporary stories, there’s something for everyone! I’ve found some many new authors to read by investing in a Kindle, and falling in love with the convenience and price of the ebook! I have a big year planned! Secrets at the Maple Syrup Farm is out at the end of March. Then there’ll be Missy’s story, she’s the local hairdresser in Ashford, so all the stories are connected. And wrapping the year up I’ll have the second instalment for Sarah, with Christmas at the Bookshop on the Corner! I’m really looking forward to it! 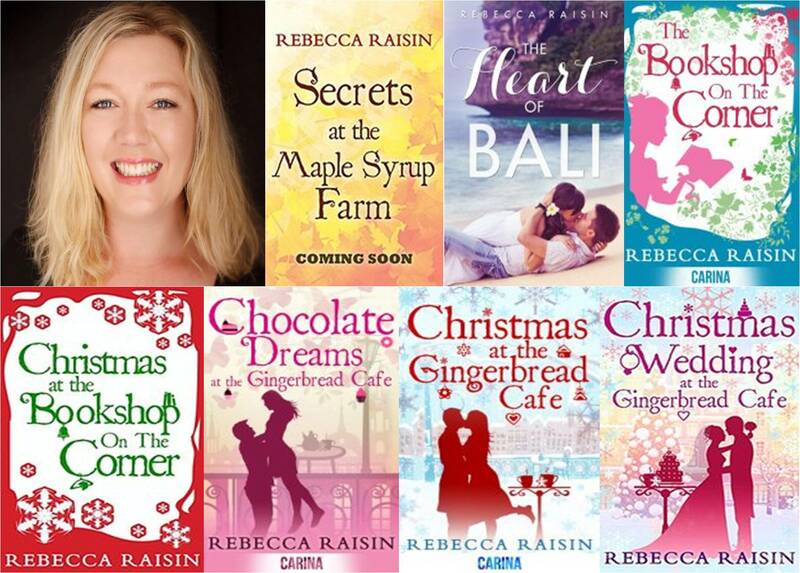 I was shortlisted for the RWA Ella award for Christmas at the Gingerbread Café. That was a huge thrill for me, being among so many well-known names! I was also shortlisted for the UK Festival of Romantic Fiction best short romance for The Bookshop on the Corner. Aside from that I had five books out, and met a range of lovely people online who’ve supported me from day one! The romance writing/reading community is wonderful like that, and I couldn’t have asked for a better year, considering it was my first one writing for Carina UK. I adore my editor, and the team at Carina UK, and feel like we work really well together!